This standard provides guidance for minimizing risks to personnel during emergency response to a nuclear criticality accident outside reactors. This standard applies to those facilities for which a criticality accident alarm system, as specified in American National Standard Criticality Accident Alarm System, ANSI/ANS-8.3-1997, is in use. 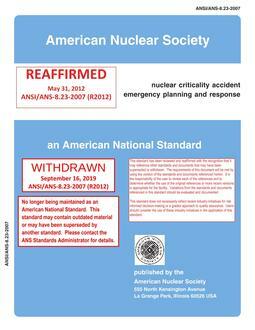 This standard does not apply to nuclear power plant sites, nor to licensed research reactor facilities, which are addressed by the provisions of other standards. This standard does not apply to off-site accidents, nor to off-site emergency planning and response.